User files include profile pictures, uploaded assignment submissions, and other files uploaded to your personal Canvas file storage area. By default, each user has 50 MB of storage space in Canvas. Administrators can change the quota for user files for the entire institution. In Global Navigation, click the Account link , then click the Files link . All your user folders display in the left panel . View files in the right panel by clicking the name of a folder. You can view your user quota and what percentage of that quota has been used . If you are enrolled in any courses as a student, files that have been submitted as assignments do not apply to the user quota and are stored in the unfiled folder. The My Files folder creates folders based on default events in Canvas. Once you upload a file related to one of these areas, the folder and accompanying file will be created for you. The Conversation attachments folder  stores files that you attach to Conversations messages. If your institution enables you to upload a profile picture, the Profile pictures folder  stores photos that you upload as a profile picture. The Unfiled folder  stores files that you attach to discussion topics or discussion replies. My Files also includes any additional folders you create to organize your files, as well as any files not uploaded to a specific folder. If you have a student role in any courses, any files in the My Files folder that are not related to assignment submissions count toward your user quota. If you have a student role in any courses, the Submissions folder contains copies of your assignment submissions; assignment are organized by course folder and displayed alphabetically. However, assignments submitted through an external tool are not copied to the Submissions folder. Note: For online assignment submissions, if you submit a file that you've previously uploaded, you can delete the previously uploaded file after it has been submitted and free up extra storage in your user files. Your course folders display below your user files . 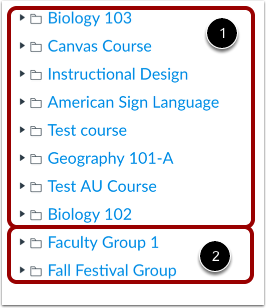 If your Canvas admin added you to a group, group folders also display below the course folders . You can easily move and organize files from your group, course, and user files. 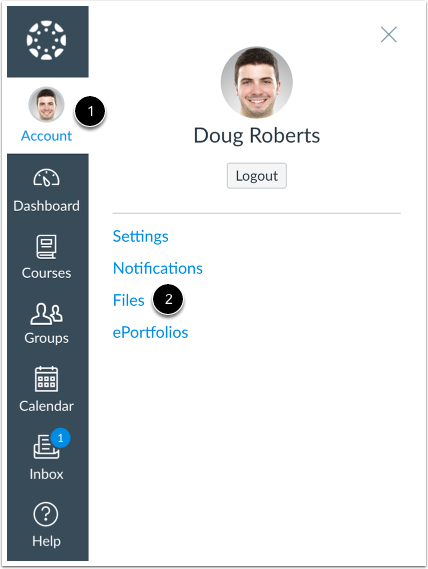 You can also view course files and group files directly from the course or group.You can drag and drop files from your user files into a course or group folder. Previous Topic:How do I configure a manual entry external app for a course? Next Topic:How do I view course files as an instructor? Table of Contents > Files > How do I view my user files as an instructor? Re: How do I link a file in myfiles to a course section?